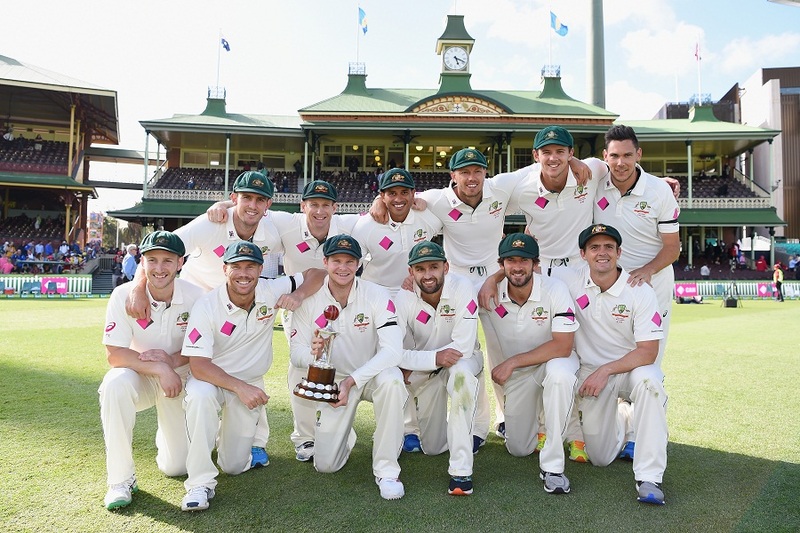 The victorious Australia side pose with the Frank Worrell Trophy on the 5th day of 3rd Test between Australia and West Indies in Sydney on Thursday. Australia's skipper Steve Smith said the West Indies had rebuffed a creative plan to revive the rain-hit third Test after it petered out in a draw on Thursday.Smith said he approached his opposite number Jason Holder with an offer to declare at 0-0 and then allow the tourists to build a 370-run lead with 70 overs to play.But the deal was rejected, he said, and the third and the third and final Test in Sydney, which lost two full days to rain, ended in stalemate.Australia, who had already clinched the Frank Worrell Trophy series 2-0, were keen to make it 3-0 and push their claims to return to the top of the Test rankings. "There was (an approach). Unfortunately they didn't come to the party, I offered him (Holder) 370 runs in 70 overs, which I thought was pretty generous," Smith told reporters. "It would take some good batting to get that on a day five SCG wicket but they weren't up for the challenge unfortunately. "They would have had to declare this morning, I would have declared nought for nought and then bowled lob-ups for seven or eight overs or whatever it was, 370 off 70. I offered but they weren't willing to take it. "We want to try and win every game we play and today was a perfect opportunity to set the game up for a good chase and for the fans who stayed out this afternoon. "Smith said he had checked out the legalities of such a bold move with the team coach Darren Lehmann. "Yeah, I spoke to Boof (Lehmann) who read through the rules and said you are allowed to do that kind of thing. That was on our cards today and unfortunately they didn't come to the party," he said. "We can't control the weather. It's been a disappointing week here in Sydney. It would have been nice to have got a bit more play in, but we can't control that. We did everything we could this week. "Holder confirmed the approach by Smith but said the team, whose 330 was their best innings of the series, wasn't keen to take up the Australian offer. "He came to us and made an offer, I just went back to the team and we thought at this stage of our development it wasn't the best thing for us," Holder told reporters. "We had (Denesh) Ramdin who was scoring well and looking well, so we just gave him the encouragement to go out there and build an innings and build some confidence. "We set out at the beginning of the series to bat 90 overs each time we batted and get past the 300-mark. "That was one of the things that we wanted to achieve today and we achieved that. "Ramdin scored 62 in the West Indies' first innings and in reply Australia scored 176 for two, with David Warner hitting the fastest Test century at the SCG off 82 balls on his way to an unbeaten 122.